MOSCOW, October 29. /TASS/. Unloading of the European telecommunications satellite Astra 2G from an Antonov-124-100 jet of the Volga-Dnepr cargo carrier airline has been completed at the Baikonur Space Center in Kazakhstan, Taissiya Nikitenko, the chief of the airline’s public relations section told TASS on Wednesday. The unloading operation took up several hours. Since the satellite was to be reloaded onto a railway carriage, the Antonov-124-100, the world’s biggest cargo jet was taxied at a closest possible distance of about 20 meters to the railway tracks. After that the container with the satellite inside was placed on a special frame and reloaded by a crane to a railway platform. 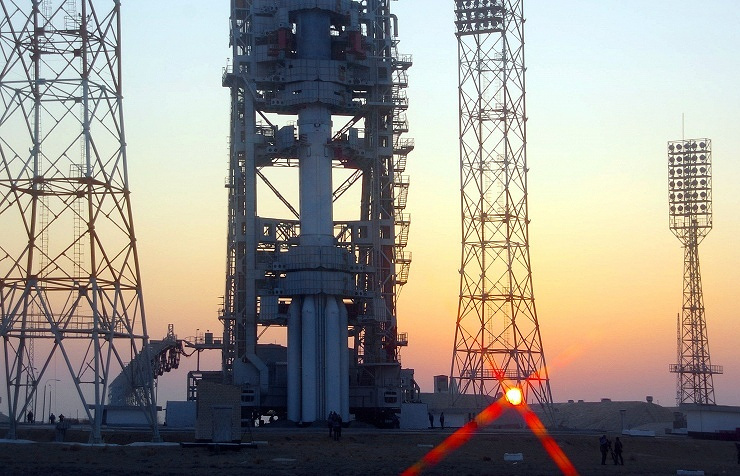 The total weight of the equipment delivered to Baikonur exceeded 48 tonnes, Nikitenko said. On the way to Baikonur from Toulouse, the jet made an unscheduled landing in the city of Ulyanovsk, the Middle Volga area, but Nikitenko told TASS it had not affected the reliability of transportation. All the parameters set forth for air haulage of the satellite, including the temperature in the bracket of 15 to 25 C and definite level of pressure had been observed. The Antonov-124-100, also known as Ruslan landed at Baikonur’s Yubileiny airport at 04:15 GMT on Wednesday.